When Anthony Riforgiato was about 6 or 7 years old, his dad took him to watch the races at Lake Erie Speedway. Looking on as the bandolero cars sped past, he heard the announcer at the track say that children as young as 8 years old could drive these vehicles. This immediately piqued young Anthony’s interest. But he didn’t forget. In fact, Anthony’s passion for racing was just getting revved up. Anthony began racing competitively in 2008 at age 10. Four years later, he was competing in Legends Cars, a style of car that aims to keep racing affordable and fun. As he kept racing, he kept improving, and in 2013, Anthony became the New York State Champion in the Young Lion division. 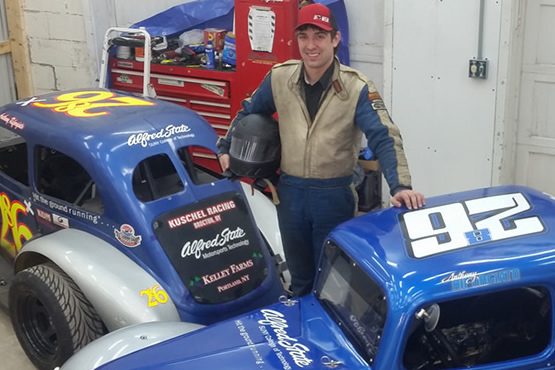 Three years later in 2016, just prior to graduating from Alfred State’s motorsports technology program, Anthony formed a partnership with the college, which allows the school’s logo to be featured on his two race cars: a 1934 Ford Coupe, and a 1939 Ford Sedan. This partnership provides an excellent way for Anthony to help spread the word about Alfred State, specifically its motorsports technology major. Last season, Anthony – and Alfred State – were featured at a number of race tracks, even cruising to victory lane at the Wyoming County International Speedway. Now a technology management major, Anthony says he is “beyond happy” with his partnership with the college.